Tech in an ICU is a back breaking job, like being a tech in general. I did it for a while when I was a tech. The RNs would have like one patient they had to turn, clean etc. A tech would have 12. These are 12 heavy pts, most on vents that need to be turned continually. You can learn as a tech and its a great way to get your foot in the door, but keep in mind that for full time techs on any unit, the injury rate is phenomenally high, so I wouldn't work too many hours. Patients are getting heavier, families are getting more demanding, and management generally doesn't back up techs. At least as an RN you have more say about how you are utilized. As a tech youre often just wanted for a strong back. You can be injured for life doing this kind of work, Ive seen it happen to many techs. Its a lot less strenuous and safer if you are an RN, so be careful and selective. Hospitals like to exploit some eager to please young nursing students so make sure you aren't getting into a situation where techs are worn out and pitched. When i worked as an ED tech i would occassionally encounter this. The thing most likely to cause it was helping a doc or PA suture a wound. Im not sure why this exactly would cause it. I guess it was the combination of blood, gore, needles piercing skin and standing still for a long time, and it would only happen randomly. Starting IVs or drawing blood never affected it. I also noticed if i was moving around it wouldnt happen, regardless of how much blood or gore was involved. It was a combination of standing still in an awkward position and the sight of blood and tissue. Staying well hydrated and making sure i ate before my shift was important. I floated for a while during my PCT days and this was my experience. Floating full time as a PCT is a very different experience from working on one unit, or occasionally floating to another unit, so I wouldn't base nursing or health care on that experience. On the plus side you get some variety. On the downside PCTs in general are very overworked and in many cases the only thing keeping a shift from turning into a train wreck is that you know the routine, the staff, and maybe some or even most of your patients. Those are all luxuries you don't have when you float, so the stress level is a lot greater and everything will take longer. Because you aren't familiar with the staff and they aren't familiar with you, they don't necessarily have your back, and may view you with suspicion and even contempt. You also may have to deal with units that tend to be very cliquish or catty towards new or unfamiliar staff, so you need to have thick skin. From what I saw Nursing Students tended to have the toughest time floating because they are often the most eager to please, inexperienced, and eager to fit in. Older more experienced techs tended to do better because they were more likely to let the unit politics and drama roll off them like water off a duck. All in all my view on being a float PCT was that it was a mixed bag and generally not worth the aggravation, but others mileage may vary. Well if they're leaving soon, it shouldn't matter if they have a vendetta against you since they'll be gone shortly anyway. Maybe the complaint will expedite their departure. Always amazes me the pettiness of some people. Who gets upsets and raises their voice over a patient getting ICE CREAM. Really? I mean its one thing to point out it wasn't helping the patient, but to get upset over it? That is EXACTLY why the only tech job I didn't hate was in the ER. The floors and ICUs are full of people of nitpicky type A stress mongers like that, both RNs and techs. At least in the ED those people were usually weeded out and either fired or pushed out of the ED and onto a floor unit. $2,600 too much money for PCT course? Sounds pricey to me. The thing is, hospitals are all over the map when it comes to what they prefer when they hire "assistive" personnel. Some require they all be CNAs, some require they be CNAs AND have additional training, some prefer nursing students, some take medical assistants, some seem to have no real preference or requirements and just go by your overall resume(or your connections), and for some its a mixture of all of the above. You might have one hospital with different units having different job requirements for the same position. Its crazy. Pretty much the ONE thing that will get you considered by nearly every hospital is to be a Nursing student. Despite the fact Nursing students tend to be the worst PCTs starting out because they tend to the only ones hired with no experience and have only the most minimal training in PCT/CNA skills. Hospitals do this so they can vet future RNs, because they figure a Nursing student isn't likely to be a complete idiot(although this still occasionally turns out to be the case), and because Nurses themselves simply relate more to Nursing students than they do CNAs or MAs or trained PCTs etc. EVERY nurse was a nursing student at one time, so they have a soft spot for nursing students, even though they might not be as polished or competent as an experienced CNA/PCT. If you plan on working in an area, find out what the local hospital/s requirements are. I can almost guarantee none of them REQUIRE a formal "PCT" school or even list that as a desired qualification. Advice for new CNA student? CNA school is easy, working as a CNA is hard. I know icu nurses that admit they didn't last a month as a CNA in a nursing home. I still consider it the hardest job in Healthcare I've done, and I work as a Respiratory Therapist now. I think it should be a pre req for ALL nursing programs. Nursing school doesn't take CNA skills seriously, some of the instructors arent even proficient in those skills and you wind up with substandard nurses that think they are too good to do a lot of the patient care. Let's Ban the Phrase "I'll Go Get Your Nurse"
Here's the problem with this, it probably WONT be quicker, because the CNA/PCT/PCA might have 15 other patients(and their families), all of whom are going to be hitting call lights for anything and everything, and nurses asking them to do this or that...in between checking vitals, I/Os, feeding, bathing, ambulating, toileting, repositioning, checking BGL, emptying tubes and drains, suctioning, ISC, bladder scans, enemas, restocking, labs, EKGs, and on and on and on. PCTs/techs and CNAs are already massively overworked as it is. Every time Id come out of an isolation room after doing a bed bath or something time consuming, id check my pager and buried in between a couple dozen call lights/monitor pages id have 2 or 3 frantic pages from RNs demanding I (insert time consuming menial task). I have far more responsibility now working as an RT, but I still generally find the job less stressful and more rewarding than my years as a tech/CNA, so I'm not sure dumping EVERY backbreaking or menial task onto already overworked and underpaid CNA/Techs is really the best solution. In press ganey surveys the techs always got crucified by patients and families, because they never realized the tech had 5 times as many patients as the RNs, so they just assumed the techs were lazy or negligent. I don't know how many times when I started the shift the patient would complain I barely saw the previous tech. A couple times I actually had patients and family chastise me because the poor RN with her multiple patients(3) had to do something while I, their personal patient care tech( I had 16 patients but they assumed I was assigned only to THEM) was probably playing candy crush. If you already have experience in home health care you probably have more practical experience than the majority of the nursing students you'll be working with. From what I've seen Nursing school clinicals just gives people a tiny exposure to a techs job, and so they aren't likely to be ahead of you much, if at all, unless they have actual work experience. Ive come across graduate nurses and new RNs who've never cathed anyone, never started an IV or drew labs, never suctioned a trach, never done a 12 lead, etc and have never experienced the level of multitasking and time management you'll have to do as a tech. So the nursing students wont have any real advantage. They'll just be more familiar with things like writing care plans and understanding lab values, and other things largely irrelevant to being a tech. The fact they hired so many inexperienced nursing students probably means they are willing to work with and teach new techs. Id be more worried if all your fellow orientees were experienced CNAs and techs who've already had years on the job, because that would mean they expect techs to be ready to go from day one. Entitlement/ superiority attitude of some nurses? There are many things in medicine that were once done that were later found to be bad practice. I wouldn't hold your breath waiting for a return to the bad old days. RT's still find themselves frequently having to correct mistakes or undo damage done by RNs that thought they knew what they were doing. I could use a couple recent rapid responses I've been on as examples. So please, for the patient's sake, just stick to what you know. To the other person that suggested I flunked out of Nursing school(because naturally all other health care professionals want to be Nurses right). I was on a waiting list for RN school when I decided being an RT would be a better fit for me, in part because I'd always been impressed with the RTs Id worked around. The RNs were more of a mixed bag. Some of the very best and very worst people id worked with were RNs. RT school seemed to have a little better quality control. In fairness, its because Nursing is such a broad field that some RNs never really find that niche they are good at, whereas RT school does a much better job of ensuring someone is actually cut out for and good at the job they are going to do. Maybe the OP was content to sit back and watch the RNs responding prove his/her point. He/She obviously isnt going to get a very sympathetic response on this forum, which is why they probably just did this to stir the pot, but there are a lot of people who feel the same way. Nursing as a profession has lobbying power and influence that goes well beyond what other health care professionals enjoy, so many RNs are totally oblivious to other opinions and views, especially since many other allied health occupations are made up of quiet professionals who aren't as vocal and defensive as Nurses, but trust me, the OPs opinion is shared by many in health care, including a lot of people with MD by their name(quite possibly the majority of them). I've noticed this mindset in Nursing as well. 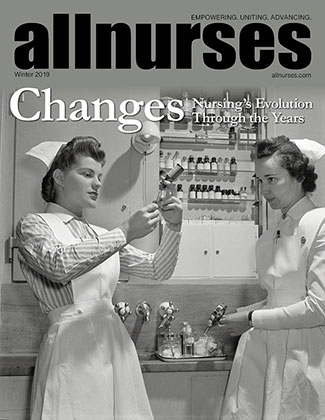 It just seems like modern nurses see themselves as the center of the universe. It's what drove me away from Nursing school and into Respiratory therapy. I hate to say this, but from working as a tech and EMT for many years I gradually realized that I just didn't like Nurses very much. Gone are the days of people who get into the profession because they genuinely cared for people. Now its all ME ME ME. I like being an RT, and loved working EMS, because I was around people who didn't just do it for the money, and who had a team mentality. I don't see that in Nursing at all. I think its a profession in crises, and I think maybe other health professionals need to step up and reduce the role of RNs in health care. They will always be necessary of course, but they've accrued way too much power and influence and patient care is suffering as a result. Benefits of becoming a CNA before Nursing School?? Good for your school. I think all students should be required to be CNAs before starting nursing school. Nursing school barely covers some of the things CNA school emphasizes, the logic being RNs will simply learn this stuff on the job. One thing that stands out is safely lifting and moving patients. CNA school places a lot of emphasis on this. You continualy practice and are tested using different lifts and lifting techniques on each other, from lifting someone to and from a wheelchair to a bed to practicing controlled falls on each other while ambulating. In my first CNA gig physical therapists worked with us during orientation and we had to be signed off by them doing different transfers on residents before we could work on our own. This training was invaluable during my time working as a CNA and tech, and I was continually amazed/appalled at how horrible RNs are at these most basic skills. Some of them really don't have a clue. When I was doing heavy lifting and transfers with another CNA I always felt safe knowing the person I was working with was at least minimally trained and competent at what we were doing. With RNs its always a roll of the dice and many of them are horrible at it, and even worse you cant tell them how to do it properly because there is ego involved and as RNs they are led to believe they know everything a CNA knows and more. Nursing home RNs usually know enough to defer to the CNAs on such matters, but in a hospital you cant tell some RNs anything. Requiring ALL RNs be CNAs first would eliminate a lot of back injuries and patient falls. The ER is generally a lot easier than the floors with a couple exceptions. If the ER techs start IVs and draw blood, you HAVE to be good at that. Most people can become proficient with practice, but occasionally its something people struggle with, both Nurses and techs. You also have to be able to work under stress. Its one thing to start an IV on a stable patient, its another to start one on a patient whos crashing or coding(they'll usually just start an IO), that's why most ERs prefer techs with an EMT or Paramedic background. Working on the floors and ICUs is more of a constant low level stress from being under the gun to get everything done, whereas the ER can go from no stress to extreme stress quickly, which someone people don't like once they've experienced it a few times. You do have to deal with drunks and psych patients in the ER, but to be honest on the floors so many patients are experiencing some sort of delirium or altered/diminished cognition that is no better there. On some heavy floors there are times when you can go a shift without having a single patient who is able to hold a normal conversation. ER tech jobs are usually highly sought after and often getting one involves networking(or nepotism). How heavy a work load depends on the shift. For night shift this is a typical load for a tech, maybe even a little light. For days it's a heavy load because you have to add baths into the mix. its impossible to say how heavy because every hospital is different and the division of labor varies. As a rule though techs will always have more work than is realistic. Supervisors would rather have overworked stressed out techs than rns, because mistakes by RNs can be more dangerous, so techs are where they cut corners. Just do what you can and prioritize and know your tech nightmare will be over when you pass the nclex. I've never known a tech turned rn who said being an RN was harder than a tech, at least outside this forum, so just do your time. I'm going to guess that English might not be your first language and you probably aren't American, but in case you are thinking about becoming a Paramedic in the US I'll comment. In the US becoming a Paramedic just isn't worth the trouble. The pay and conditions for Paramedics are pretty horrible and its an extremely stressful and difficult job, probably a lot more stressful than being an RN. Add to that the fact Paramedic school is fairly long and difficult and has a high washout rate. Even ICU RNs wanting to be flight Nurses regularly fail Paramedic school or fail the National Registry exam. In other countries the pay and conditions for Paramedics are a lot better, so I'm just commenting on conditions in the US. Oh yeah and EMT is totally different from Paramedic in the US, there is no comparison between the two other than they both work on ambulances. A Paramedic has a much greater scope of practice and much more responsibility than an EMT and the training is a lot harder. EMT school is just an advanced first aid course, Paramedic is much more than that.